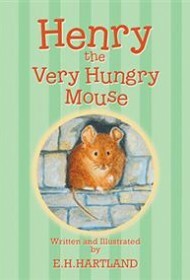 Henry the Very Hungry Mouse is the story of a lazy mouse with a big appetite. Henry leads a comfortable life. His home in the garden wall provides easy access to a bird feeder that local housecats can’t reach, meaning he never has to put himself in danger. This arrangement leads Henry to become a bit lazy and overweight, and he’s discouraged one day when the humans don’t replace the seeds in his bird feeder. Eventually, he chooses to venture to another feeder farther afield—but he runs into one of the housecats while on his mission. A chase ensues, and Henry gets stuck in a hole in the garden wall. With the help of a human, he manages to return home, but he realizes he may not be so lucky next time. While Henry is a likable character and his dilemma is engaging, the narrative’s flow is often choppy, interrupted with long biographies of the cats (two of which don’t play significant roles in the story) and with asides that end, unsatisfyingly, with “but that’s another story.” In addition, the story’s message is unclear. Are readers to conclude that Henry needs to lose weight, and this is the cause of all his problems? That it’s unwise to venture far from home? That danger is ever-present? The tale of adventure and mortal danger is also undermined because Henry doesn’t solve his own problem and is only saved with a trick of deus ex machina, when a human intercedes. While the story’s premise is interesting, and young readers will enjoy the alluring illustrations and description of Henry’s antics, the book does little to transcend its premise or redeem its main character. As a result, Henry the Very Hungry Mouse might appeal on a first read, but probably won’t stand up to multiple readings.